Your safety and comfort are of the utmost importance to us. From time to time, we will issue communications to alert you to product information and updates. If you have registered a product on this Web site, we will contact you at your registered email address. Please make sure the information you enter is accurate, and update it if it changes. If you have not yet registered your product, please do so here. The sixth (6) bullet of the Extender Disclaimer has been updated. This information can be reviewed here. This notice is in reference to the use of certain seat belt extenders with certain car seat belt metal tongues and you identifying those metal tongues in your vehicle. Although this notice impacts the use of extenders with a small portion of car seat belt metal tongues, it should be carefully read by all extender users in all countries and everyone should follow the directions as outlined below. In addition to a careful review of this information, reading and abiding by the Terms and Disclaimer is essential for all owners of seat belt extenders. If your car seat belt metal tongue is addressed by this notice, we will offer, when available, a replacement seat belt extender at no cost to you. If an alternative is not available, we will issue a refund. Compare your car seat belt metal tongue where you use an extender to the photos below. If your car seat belt metal tongue looks like a metal tongue in the photos, with the top metal bar exceeding 8 millimeters as shown by the blue double arrow, immediately stop using your extender. If you are unable to make a determination, immediately stop using your extender. Metal tongues of different seat belts inside a car often differ so check the one with which you use an extender. These seat belt metal tongues have been reported to appear exclusively in rear middle seats. In such cases, do not use the extender. We will be in touch regarding a replacement or refund of your purchase. For additional questions, you may write contact@getextenders.com. Thank you for your patience and compliance. If your car seat belt metal tongue is addressed by this notice, we will offer, when available, a replacement seat belt extender at no cost to you. If an alternative is not available, we will issue a full refund. 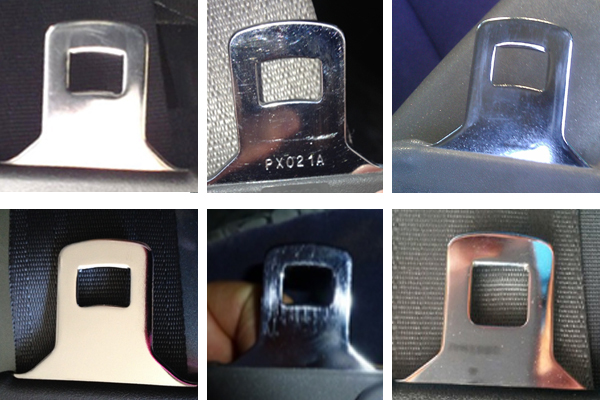 TAKE THE FOLLOWING ACTION: Compare your car seat belt metal tongue where you use an extender to the photos below. 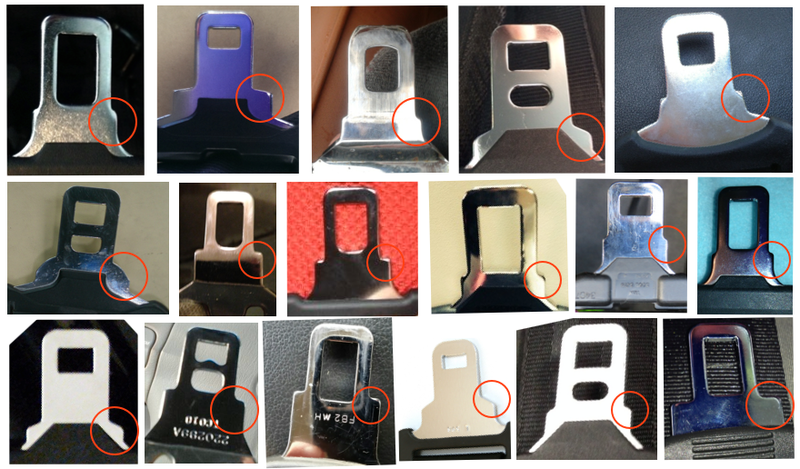 If your car seat belt metal tongue looks like any metal tongue in the photos, or has “shoulders” or “flanges” as shown by the red circles, immediately stop using your extender. If you are unable to make a determination, immediately stop using your extender. Metal tongues of different seat belts inside a car often differ so check the one with which you use an extender. This notice is in reference to the use of certain seat belt extenders with certain car seat belt metal tongues and you identifying those metal tongues in your vehicle. Although this notice impacts the use of extenders with a very small portion of car seat belt metal tongues, it should be carefully read by all extender users in all countries and everyone should follow the directions as outlined below. In addition to a careful review of this information, reading and abiding by the Terms and Disclaimer is essential for all owners of seat belt extenders. TAKE THE FOLLOWING ACTION: Compare your car seat belt metal tongue where you use an extender to the photos below. If your car seat belt metal tongue looks like any metal tongue in the photos, immediately stop using your extender. If you are unable to make a determination, immediately stop using your extender. 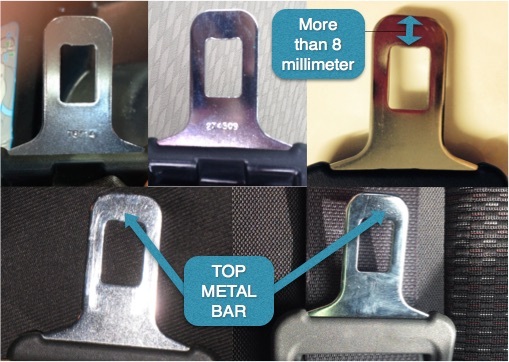 Note that the width of the metal tongues in these photos is approximately 31/32” (24.5mm), and metal tongues of different seat belts inside a car often differ so check the one with which you use an extender. The following lists include cars with some seat belts that are believed to have metal tongues like in the above photos. This is not a comprehensive list of the models where such metal tongue(s) may appear, nor do any seat belts in the listed models necessarily have metal tongues such as those pictured. In such cases, do not use the extender. We will be in touch regarding a free replacement or refund of your purchase. On September 7, 2014 Seat Belt Extender Pros announced a number of updates to its terms. These changes are effective immediately. The updates announced are applicable to all interactions with information associated with Seat Belt Extender Pros, purchases and items purchased or obtained from Seat Belt Extender Pros and its agents, officers, affiliates or assigns (directly or through other Web sites, online stores, brick and mortar stores and / or online marketplaces). Please read the updated information here: www.seatbeltextenderpros.com/terms-conditions/. Where possible and applicable, you will receive an updated notice, waiver, warning and disclaimer with products. However, for some period of time, some products may arrive to you with non-updated “Safety Information” or with updated and non-updated information. In these instances the new terms, including but not limited to notice, waiver, warning and disclaimer, shall govern. A copy specifically of this notice, waiver, warning and disclaimer as it relates to car seat belt extenders can be found here: www.seatbeltextenderpros.com/disclaimer.